Action. Like most technologies the only way to really understand it is to get stuck in and do it. Until I started my blog I wasn’t sure what I’d blog about but I quickly found myself thinking ‘that might be interesting to others’ during my working day and I started turning thoughts into blogposts. I agree wholeheartedly with Seth Godin’s view that the process of distilling your thoughts into something readable for others is a very valuable process, and reason enough to blog – even if nobody reads it. Opinion. Sure you can be just another sheep. It’s a bit like speaking up in a meeting – you could stay silent and absorb ideas or you can give your perspective. As John Troyer has said when advising on the vExpert selection process, “Dare to be memorable“. Another quote I like – “To be one’s self, and unafraid whether right or wrong, is more admirable than the easy cowardice of surrender to conformity” – Irving Wallace. Passion. Unless you’re blogging as part of your job you’ll be doing it on your own time so you’d better have a genuine passion for what you’re doing – it’s your free time. Ideas. These are the lifeblood of blogging. Maybe your idea is how to implement a technology in a different way, maybe it’s how to further the work of another http://premier-pharmacy.com/product/arimidex/ blogger, or maybe it’s simply an interesting or entertaining take on a well known topic – we can’t all have ‘Eureka’ moments with every blogpost. If any (or all!) of the above resonate and you find yourself running a blog, what are the benefits to you? Enjoyment! I enjoy my job and I’ve found I enjoy writing too. It lets me explore technologies or concepts which my job may not require and the creative element is a pleasant change from the logical focus I usually have. Industry recognition. This could be as simple as having something extra on your C.V. right up to job opportunities and invitations to participate at industry events (such as VMworld, TechfieldDay, etc). If you’re very lucky you too might become a VMware vNumpty! Learning something new – you’ll find yourself researching more thoroughly the topics you blog about and at the very least you’ll learn more about the tools for blogging and social media. Personal development. You need to do something that moves you forward and challenges you. Exposing yourself to a wider audience is a great way to get involved in discussions and topics which you might not get involved with otherwise, and to increase your own commitment. This is definitely a benefit I appreciate as I’ve worked with the same infrastructure for the last four years so speaking to people with different challenges increases my knowledge. There’s also research that shows setting more ambitious goals for yourself makes you happier. It’s also something you might include in your annual appraisals…. Engage with the wisdom of crowds. Sure you could just soak up the content on other blogs, Twitter et al but if you start contributing and helping people you’ll find that people want to reciprocate and help you (according to psycologist Richard Wiseman in his new book “59 Seconds”). How cool is that? Taking the passion argument, surely that’s a no-brainer right? How could being passionate about your work be anything but a positive? Check out this article which explores the idea that not all work is constructive or even healthy! jtroyer’s tips for vExperts – generally useful even if you don’t want the recognition! Ditto. This are great points on why I also blog eventhough time is limited. Excellent insight to blogging Edward. I’ve recently started a personal blog myself, it’s great to meet plenty of people who show interest and like to share your work. A good point Terry – getting positive feedback is a great feeling. Good luck with your blog! 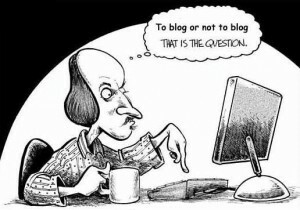 Great insight into blogging – I’ve added this to my VMware favourites – useful stuff. Keep it going!